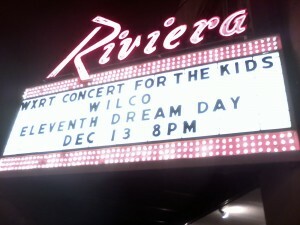 For those that don’t know, Wilco is in the midst of a 5 night residency in their home city of Chicago at the moment. They performed on Monday night at the Civic Opera House for Night 1. I was unable to get tickets to that show (or I should say, rejected the option of buying very, very bad seats), but was able to make it out for Night 2 at the Riviera Theatre. This isn’t a show review, and I’m not going to write one right now for a couple reasons. The first being we’re in the middle of Listmas here and I’m buried in things I have to write. The second is that there are still 3 more Wilco shows to go before the week ends. I will be attending two of those three. Next week, once all the Wilco shows in Chicago have wrapped up, I’ll throw something together that essentially recaps all of them. For now, I wanted those looking for it to have the set list for the Riviera show. Naturally, the new album “The Whole Love” was (and will remain) the focus for the time being, however what I find most interesting are the choices made outside of the new material. Will the band try and attempt vastly different set lists each of their 5 nights in Chicago? The Riviera show featured plenty of changes from the Civic Opera House one, so we shall see. I must say that I LOVE how much attention “A Ghost is Born” got, and whipping out little-heard songs like “I Must Be High” and “Just A Kid” (from the freaking Spongebob movie soundtrack) was truly inspired. Overall a spectacular night, to the point where they even made the typically horrid sound system of The Riv work some magic. Must’ve been because I was standing next to the soundboard. Anyways, I’ll have more info and some additional set lists from the Wilco shows on Friday and Sunday nights as well, not to mention a full writeup/recap coming early next week. Until then, here’s the set list from The Riv show.